It is not without basis that the Philippine real estate industry is cautiously optimistic of its prospects for 2018. Although headwinds are expected, the fundamentals that will likely support and sustain the industry’s stellar performance in recent years are seen to remain strong, according to some of the country’s leading commercial real estate services firms. Colliers International Philippines manager for research Joey Roi Bondoc noted, for one, the current key macroeconomic indicators that point to a sustained gross domestic product (GDP) growth over the next three to five years. “Perennial growth drivers such as household consumption remain robust while manufacturing and foreign investments’ combined contribution to aggregate economic output continues to expand… Overseas Filipino workers’ remittances and outsourcing revenues should sustain strong domestic demand, partly shield the Philippine economy from global economic shocks, and provide trickle-down benefits to key segments of the economy, including property,” Bondoc said. “The Philippines is becoming a more attractive investment destination in the region. As a result, we see more foreign property firms partnering with local developers in building several office, residential, retail, even township projects. The international partnerships will make the property landscape in the Philippines more competitive. Overall, more local and foreign brands result in greater competition which should ultimately benefit Filipino consumers,” he added. Clearly, this optimistic outlook is shared by many real estate firms that have, in recent years, been aggressively launching new projects, even within the metro, despite the limited spaces that are available for development. One of the areas that is often in the radar of most property developers and investors is Quezon City, which had posted the highest growth rate of 24 percent over the past four years compared to its neighboring cities in Metro Manila. The metro’s largest city in terms of land area houses the top universities in the country with student population rising by 2 percent since 2011. It also ranks second highest in terms of annual revenue and tax collection. And there are many locations within Quezon City that are specifically targeted by businesses and developers given the existing demand drivers. The Katipunan area, for instance, had seen its land values grow by about 8 to 10 percent over the last five years given the demand for residential, retail, and lifestyle developments. Such a strong demand is being driven primarily by the presence of institutional establishments such as the University of the Philippines (UP), Ateneo de Manila University, and Miriam College; and of high end residential villages such as La Vista, Varsity Hills, White Plains and Ayala Heights. Katipunan thus remains an attractive location for property developers, investors, and homebuyers, as new residential and commercial projects are being launched here. Hence, now is proving to be the best time for anyone to invest in Katipunan. And one of these latest projects is The Arton, which is jointly being developed by Rockwell Land Corp. and Mitsui Fudosan Co., Ltd. 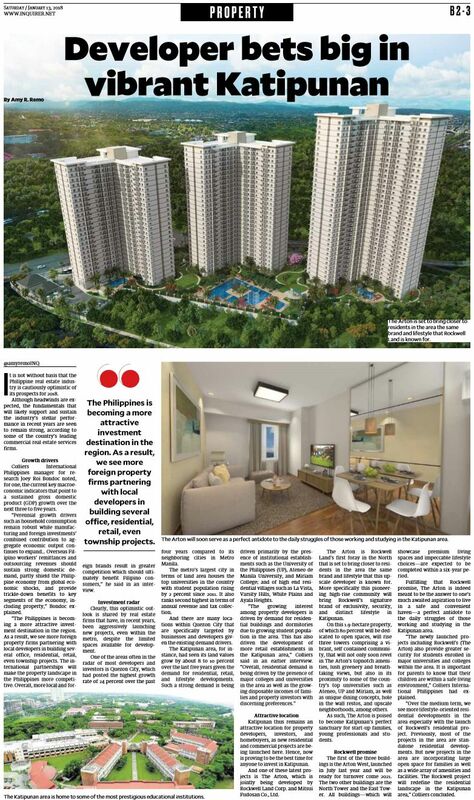 The Arton is Rockwell Land’s first foray in the North that is set to bring closer to residents in the area the same brand and lifestyle that this upscale developer is known for. More specifically this pioneering high-rise community will bring Rockwell’s signature brand of exclusivity, security, and distinct lifestyle in Katipunan. On this 1.9-hectare property, of which 80 percent will be dedicated to open spaces, will rise three towers comprising a vibrant, self-contained community, that will not only soon revel in The Arton’s topnotch amenities, lush greenery and breathtaking views, but also in its proximity to some of the country’s top universities such as Ateneo, UP and Miriam, as well as unique dining concepts, hole in the wall restos, and upscale neighborhoods, among others. As such, The Arton is poised to become Katipunan’s perfect sanctuary for start-up families, young professionals and students. Fulfilling that Rockwell promise, The Arton is indeed meant to be the answer to one’s much awaited aspiration to live in a safe and convenient haven—a perfect antidote to the daily struggles of those working and studying in the Katipunan area. “The newly launched projects including Rockwell’s (The Arton) also provide greater security for students enrolled in major universities and colleges within the area. It is important for parents to know that their children are within a safe living environment,” Colliers International Philippines had said.